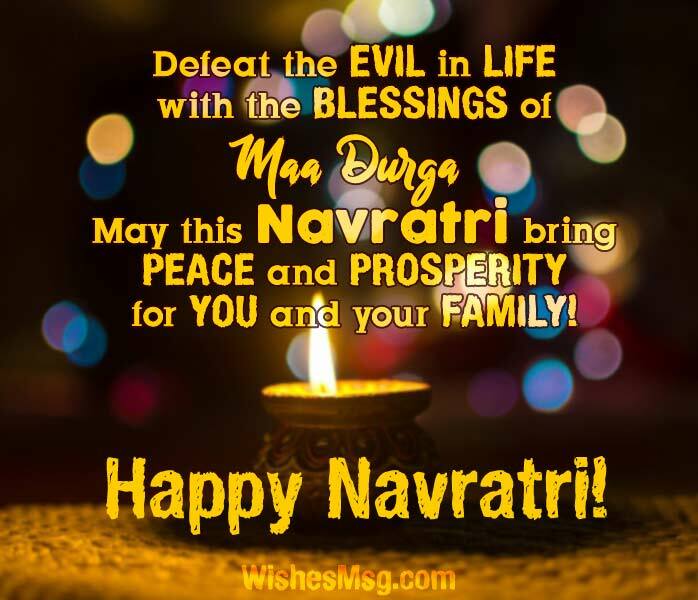 Navratri Wishes Messages : Navratri or Navaratri is the nine days of spiritual journey of Hindu people displaying absolute devotion to the age-old tradition of Hinduism. It is celebrated by the Hindus all over the world with colorful Hindu rituals. Navratri is the celebration of the victory of goddess Durga over the demon Mahishasur. From the first day of Navratri to Dussehra or Vijayadashami, the entire duration of this wonderful occasion is full of fun, happiness and joys! Double the joy of this Sharda Navratri for your friends, families and close ones by sending them some wonderful Navratri Wishes and Happy Navratri Messages. Here are some amazing Navratri Wishes for the most spectacular Hindu festival on earth. You can also use them as your Navratri Greeting Cards Messages. 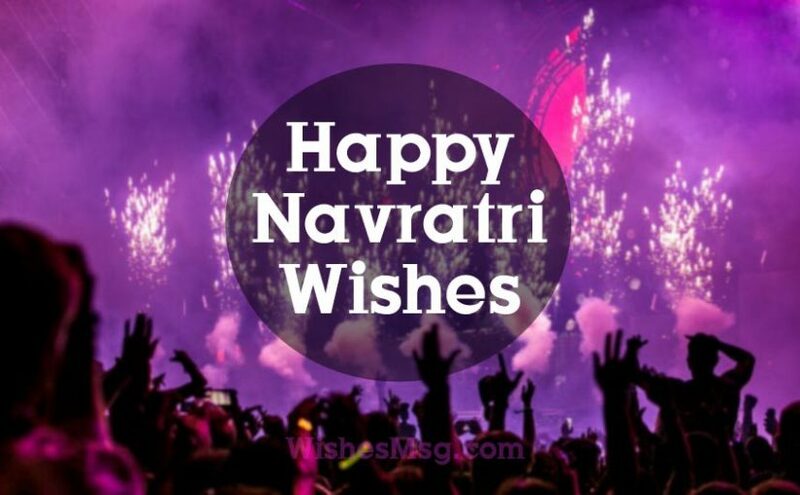 Have a look at these Happy Navratri Wishes Messages to get yours! May you become victorious over all the problems in life just like the goddess Durga emerged victorious over the evil. Wishing you nine wonderful nights of peace and happiness! May you and your family be protected by the power of goddess Durga forever. Enjoy this beautiful occasion of Navratri with your family and close ones! May all your wishes come true during this holy occasion. Let yourself be overwhelmed by the grace of Maa Durga. Wishing you a colorful Sharda Navratri! The time that we all have been waiting for has come. Gather all your unfulfilled dreams and let them welcome Maa Durga as she makes them all come true! I wish this Navratri will bring you all happiness in this world. May you and your family be always blessed by the divine gifts of Durga. Happy Sharda Navratri 2018! May your life become colorful with the colors of spirituality and religion. Enjoy every moment of these glorifying nine nights of Hinduism! May the goddess Durga ushers your life with happiness, peace and positivism throughout the year. Have a wonderful Navratri! Enjoy the occasion with your family and friends! Defeat the evil in life with the blessings of Maa Durga. May this Navratri bring peace and prosperity for you and your family! Happy Navratri! The joy of this beautiful occasion is incomplete without you. I’m thinking of you as the colors of nine nights takes over the world. Happy Navratri dear! This holy occasion always reminds me of all the blessings I have received in life. You are one special gift among them. I wish you a wonderful time with your family! Nine nights of spiritual journey is much more elegant when you are with me. Let’s celebrate the victory of good over evil together this time! This Navratri is very special for me because this is the first time we are celebrating it together. Let’s enjoy the moments and make some unforgettable memories! Let this Navratri be the end of a wonderful year together and the start of a much more wonderful journey together. I love you! happy Navratri! Its time to welcome Maa Durga at our doorstep and thank her for all the special gifts we received this year. Let’s make this Navratri a great one to remember! We have defeated all the odds and never left each other. Let us be thankful to goddess Durga for giving us strength and patience. Happy Navratri! I want you to know that I’m thinking of you on this special occasion of Navratri. I hope you are also thinking of me some times. Happy Navratri! I feel lucky to be raised in a family that is so religiously devoted to Hinduism. Navratri has always been a spectacular occasion for me. Wishing everyone a happy Navratri! Navratri becomes much more than a holy occasion when someone has neighbors like you. Wishing my awesome neighbors a great Navratri this year! You people taught me that devotion to one’s religion leads to greater joy. On this very special occasion, I want all my relatives to know that I’m lucky to have you! Nothing in this world is more joyful than enjoying Navratri with family and relatives. May goddess Durga surrounds us with her blessings forever! Let’s celebrate the victory of the good over the bad, just over the unjust, light over the dark. Let us all be enlightened with the teachings of God Rama in this Navratri! May the goddess Durga keep our family from evil forces of this world. May she protect every one of us with her divine power! Happy Navratri to all. It’s a great occasion for us not only to celebrate but also to educate ourselves about the holy religion of Hinduism. Let’s make this Navratri a great one to remember! Happy Navratri to each and every member of my family. I wish you have wonderful time together. Let’s celebrate the arrival of Maa Durga on this earth! 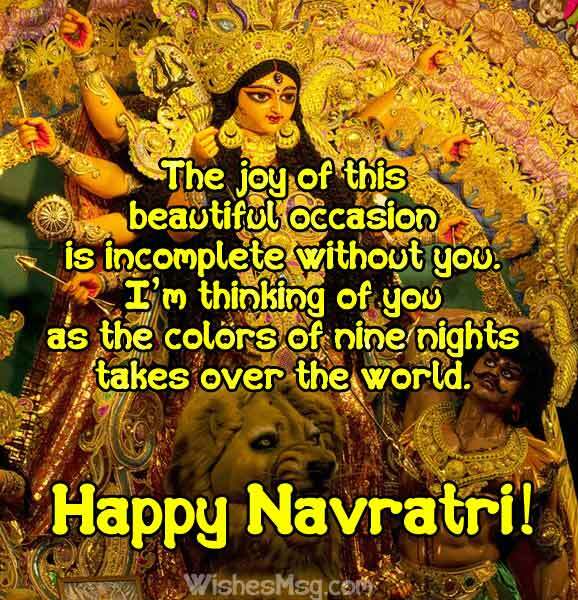 I wanted to write a Navratri wish for you. But I realized, its easier for me to make a list of the gift items you should buy me for this Navratri. Enjoy! Enjoy this beautiful occasion with all your hearts. Have unlimited fun with family and friends. But don’t go off the limit. Because you don’t want to end up in police custody. I know you have already started missing meats. Anyway, all the best wishes for you for the nine days of ‘Vegetation’! There will always be bad people like you in this world. So, goddess durga will keep coming back every year. Happy Navratri! The celebration of holy Navratri is incomplete without a friend like you to make fun of. Thanks for being my dumbest friend ever. 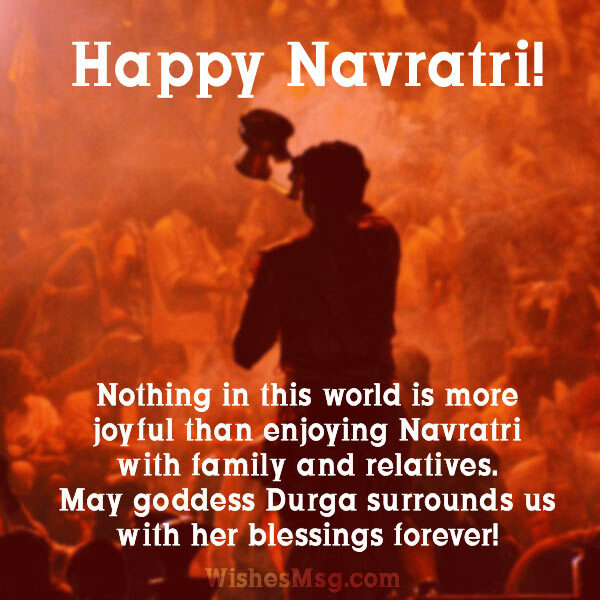 Happy Navratri 2018! You have changed so much from the last Navratri! Last time you were bad. But this year, you are bad and fat! Maa Durga will be surprised to see you! 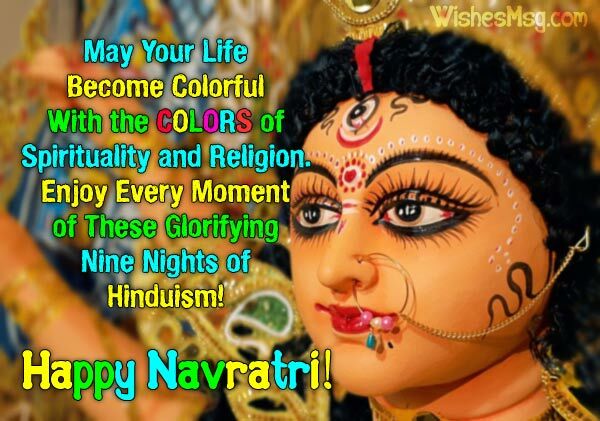 I just found out you are special enough to me to send you a Navratri wish text. So, Happy Sharda Navratri dear friend! Don’t call me up to join your stupid adventures! You can also post them on Facebook, Whatsapp, Instagram, Twitter or on your favorite social media. Let the joy of Navratri spread through the world and touch every heart with colors of victory! Make this Navratri awesome for you and your loved ones!